By Rean in Blogging. Updated on April 9, 2018 . The evolution of online feedback and commenting has come a long way; from the old school guestbook to forum and feedback form, and from native platform-dependent commenting systems to today’s 3rd party commenting systems that work cross-platform regardless of what programming language or scripts your site is based on. These 3rd party commenting systems do more than just allowing visitors and readers to drop comments. Most of them support comprehensive comment managing backend, spam control, blacklist/ whitelist management, integration with social media, theme customization and much more. Today, I’m going to bring to your awareness three of the most commonly used (by bloggers and site owners) 3rd party commenting and discussion systems, respectively Disqus, IntenseDebate and LiveFyre. I’ll also discuss some of their key features, what I like and what I think they may lack of. Lastly, at the end of each, I have also thrown in a couple of useful links for your reference. Disqus is a mature comment management system and perhaps the most used amongst bloggers and website owners. Introduced back in 2007, it is currently serving more than 750,000 websites. According to a recent study done by folks at Lijit, 75% of the websites using 3rd party commenting system are powered by Disqus. Whether you are using Disqus for the first time or migrating from other commenting systems, integrating Disqus with your website can be fairly simple. Right after you’ve signed up with Disqus, do check out the Import / Export section to find out more instructions on how to import your existing comments from various platforms (WordPress, Blogger, Movable Type, or other commenting systems) to Disqus. Disqus is mobile friendly; its interface swaps according to different media so commenting is not affected even if your readers are on mobile browser. On top of that, Disqus also offers a mobile app for the convenience of site owners to manage comments and their communities on the go. Disqus apps are currently available for iPhone and Android. Leaving comments or responding to a comment on a Disqus-powered system is a bliss, it is almost real time. Latest comments are reflected instantly without the need to refresh the entire page. For site owners, you can (optionally) be notified via email when a comment has been made on your website, and the best part is – you can respond to it right away from your email. 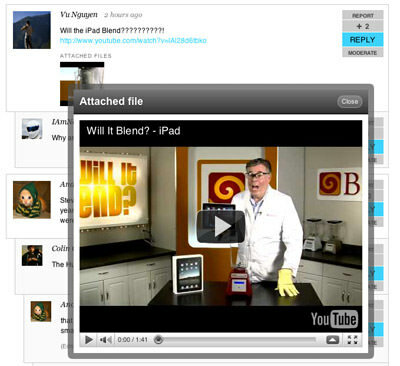 And for commenters, you can even attach additional media (photo, link, video, etc) along with your comments. Disqus’ core platform is free, but if you need more out of your commenting system, Disqus offers 3 subscription-based paid packages, each with their own respective of premium tools. Compatible with search engines, in another word – SEO friendly. Allows commenters to post as guest, or login via OpenID or social networks IDs (Facebook, Twitter, Google and Yahoo). Allows user to flag comments. Easy comment moderation via admin panels. Supports blacklist/ whitelist and word filtering. Allows site owner to display Tweets and other reactions. The easiest way to sell IntenseDebate is probably stating who are the folks behind it. 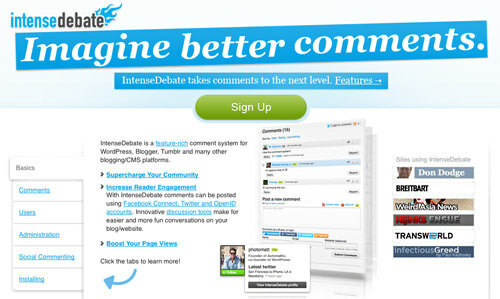 IntenseDebate is an Automattic product, the same guys who brought you WordPress, PollDaddy, Akismet and other cool web services. If your blog is running on WordPress and you are looking for a 3rd party commenting system for a chance, you know this may be your best bet as IntenseDebate is created and maintained by the same people who coded your blog platform. Reputation points is one of the key features I like about IntenseDebate. It allows users to reward well-thought and constructive comments with points and have them appear on top of others less quality comments. I find it a pretty good way to encourage higher quality discussion. IntenseDebate sends an email to commenters whenever someone response to their comment. Not only this is a good way to keep the discussion going, it also makes readers keep coming back! Similar to Disqus’ comment flagging, IntenseDebate allows you to report any inappropriate comment and on top of that, IntenseDebate allows you to state the reason for reporting. Another great function of IntenseDebate is that it allows users to simultaneously tweet when they post a comment. It is yet another great way to draw more attention and traffic to the post. 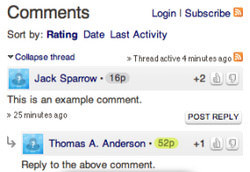 Supports numerous widgets to show off your comment stats, most recent comments, most popular comments and top commenters. Allows users to login via OpenID, Twitter, Facebook or even WordPress.com ID. Developers can take advantage of the Plugins API to make commenting and discussion even more interesting. E.g., adding PollDaddy polls, embedding YouTube Videos, etc. I noticed that IntenseDebate seems to be a little slower in terms of loading speed compared to Disqus and LiveFyre. Anyway, it could be my setup or my Internet connection. 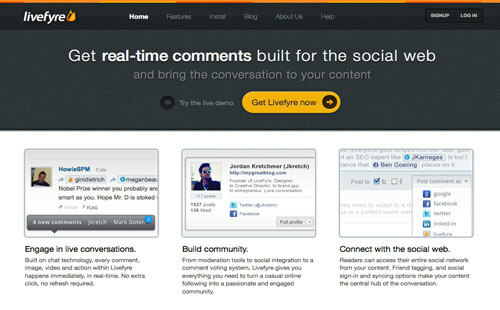 Last but not least – Livefyre, the latest addition to the 3rd party commenting and discussion system market. They may be new but that does not make them the weakest. And as the matter of fact, pardon my subjective opinion; LiveFyre is my favorite among the three. It is simple, very human-engaging, easy to use and consists most features we see in Disqus and IntenseDebate. Livefyre allows commenter to tag other users in their comment using the ‘@’ symbol, pretty similar to what you can do on Facebook. Tagging LiveFyre, Facebook, Twitter users are supported. Every time you enter a comment, you can also choose to have them posted simultaneously to Twitter, Facebook or both. Similarly you can also share someone else’s comments on Twitter and Facebook. Whenever someone chooses to “follow” a conversation, they are automatically listening – meaning they will get notification whenever there is an update. Livefyre shows you in numbers, how many commenters are online and how many are listening to a particular conversation. Supports comment votings and user ratings. Centralized admin panel for comments moderation. Supports blacklist/ whitelist and spam control. Social media (Facebook, Twitter, LinkedIn) sign in.